Back to the Future BrickHeadz found in Target! I'm posting the images in good faith that they were taken legitimately as Ted says: "These were on a cart out in the public floor space about to be stocked on the shelves. I don’t work for Target and I did not take these images in the back warehouse or anywhere “private”. They were right out there for anyone to see. Interestingly, they only had 2 of them. Maybe I should have bought one, but I passed on it because the boxes were kind of messed up." There's a picture of the back of the box after the break. Shut. Up. I knew these were rumored but I didn't think it was real. They look so great! I was just at my Target to pick up a classic cop (I did find one by the way along with a $2 Friends polybag and a $9 Ghostbusters dimensions story pack. It was a great Target day LOL) but I didn't see anything like that. I hope they put them out soon. ... I... have... resisted... brick heads.... for so long... but alas... my resolve... is b-r-o-k-e-n. Interesting . . . there is nothing on the Target website. Would love to get these . . . love Brickheadz! Love them. They look so much like the characters! Oooh, is that a camcorder print I spy? The more BH range goes on, the better they are. It seems that even if they promised a few days ago (and will try for sure, I do not doubt of their sincerity) it will be hard for Brickset team to stop articles and reviews about them ! BH possibilities being almost infinite, as Funky Pops are, and sales going better and better, I think Lego will use this vein as long as possible... And they would be dumb not to do so. How many news and releases in the last three months? 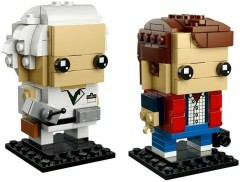 Marty and Doc main details are really well captured and reproduced. Want that one, but faaar away from any target shops. ^^ We're not stopping, just pausing for now. Tonnes better than the Solo ones and that silly Cylon looking captain phasma..
After the SNFU on the Han & Chewie, these are PERFECT!! I was excited before, but now I’m SUPER excited!!! These are probably top 5 best BrickHeadz so far! Why are some bad and some really good..
Looks cool think I many get these. I had purchased a couple but then lost interest. Fun fact: "BH" means "bra" in German (short for "Büstenhalter"), which makes all the posts and comments about BrickHeadz just that much more fun. Hey, kid! What did you do, jump ship? Well what's with the life preserver? LEGO Brickhead is the next LEGO Games (The board games) and LEGO Dimensions. LEGO throws a ton out at once trying to force their way into a market. It fails and ends within a few years. It's always a good sign when the Star Wars double pack was clearance out within weeks of release. ^"It's always a good sign when the Star Wars double pack was clearance out within weeks of release." This pack was specifically created to be released in conjunction with The Last Jedi, Target can decide when they no longer need these products on display. And since the single packed ones are still available it is wasted shelf space. Also, these look great! 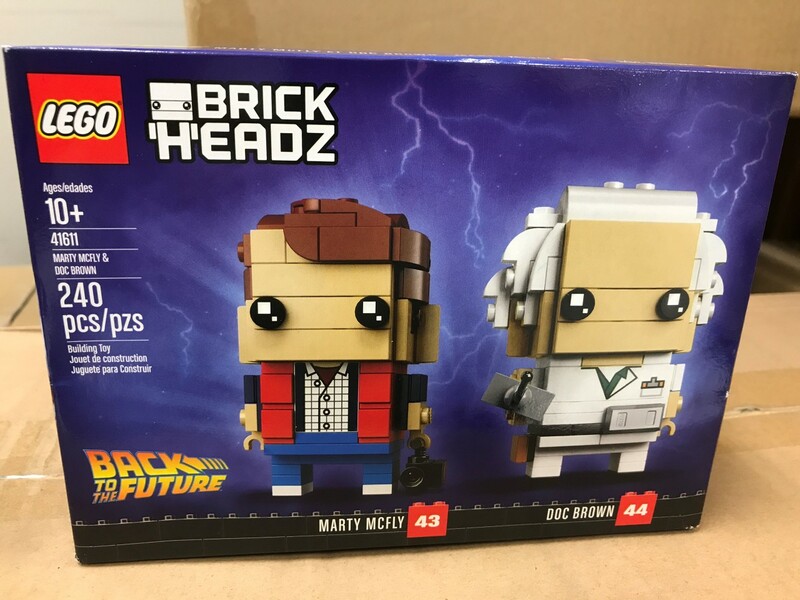 The only thing that bugs me is the 1x1 tile on Marty's face. I must resist, only the Go Brick Me so far. These will be the first ones I buy. Easily... now just praying for some classic Jurassic Park ones! I'm not really into Brickheadz (I do have a 3) but agree that these look fantastic! I actually said Great Scott when I saw this!!!!! So excited! I’ve been waiting to long! That doesn't look like a regular Target store shelf to me. Maybe on top of the actual shipping boxes? Either way the BH line has been improving but the eyes still weird me out. These look awesome. Hopefully its a sign that Lego is going to be returning more focus on BTTF after the initial Ideas set and the small Dimensions packs. I would love to see a mini-wave re-releasing an updated Deloreon (I never got the first one), Clock Tower, or the Time Train. Maybe as D2C sets? Would not be surprised to see some of the other Dimensions licenses (the ones that haven't expired) crop up as Brickheadz. if you got em, why not use em? These look great, even to a BH-"hater" like myself. Not enough for me to pick them up, but very cute. Ohh I’m reviewing that one!!! I don’t see why everyone loves these so much. Obviously Back to the Future is a popular theme here, but there is nothing special about the design of these. I don't really care either way for the Brickheadz, but when you scroll down to, "Brickset's most recent articles/reviews! ", all six of them currently are Brickheadz. It's just, I can understand why people are tiring of the trend. And yes, I will be getting this set once its available here. 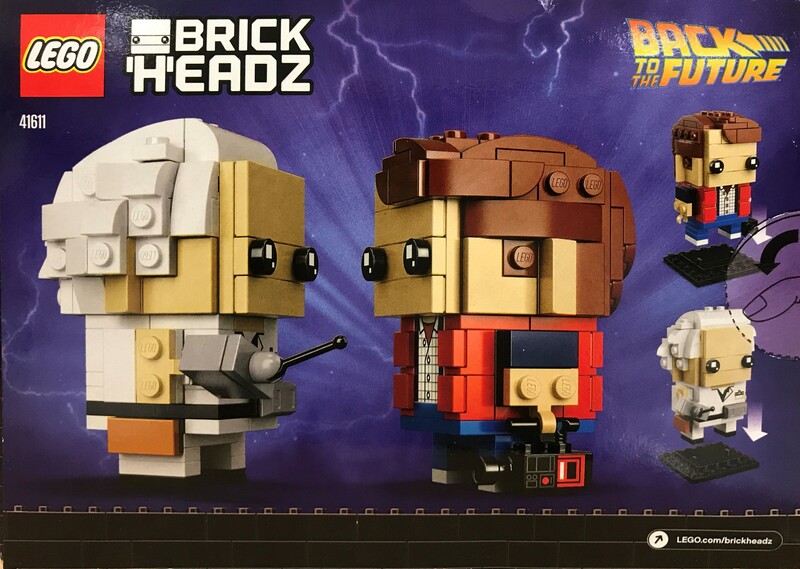 Even a BrickHeadz treatment can't lower my excitement for all things BTTF. Great set! A must-have but do these also come to Europe? A bit off-topic: Does anybody know which BH's sets are no. 41 & 42? At some point I will produce a view on Brickset to display them in numerical order. Sure, my first BrickHeadz LEGO set! I love them. I would prefer some minifig sets from BTTF. Would even by a Biff car chase set. Not sure about the BHs though. I love all these "one-off" Brickheadz sets like Owen+Blue and this. It creates even more variety and options for collectors, and the fact that most of them are two packs is fantastic. ^^^ That spreadsheet you posted mentions Nonnie and gives a link to instructions to build them. If you can contact the creator of the spreadsheet it's worth noting that Nonnie was also in the Go Brick Me set. Unfortunately, all the Targets have closed down here in Canada. . . Personally I am looking forward to see Goofy. Those Squareheads look a lot like Ric and Morty. Great job on a mediocre toy. These are a must buy for me! A huge BTTF fan. They both look fantastic and the life preserver looks great! Real shame there's no hoverboard just like with the delorean set. I ended up buying one from the Dimensions set to put on display with the car as I've built it in BTTF2 style!